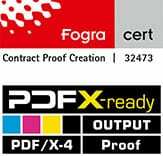 In the ISO 12647 the ISO norm for standardized printing. It shows the main cornerstones for standardized, color-accurate prints. The authorities responsible for the proofing requirements are therefore in the standard ISO 12647-7. The year after the colon refers to the year of the current valid version of the standard. The ISO 12647-8 for the Validation Print was so last updated in 2012.